League of Bicycling Voters Los Angeles – The power of community. 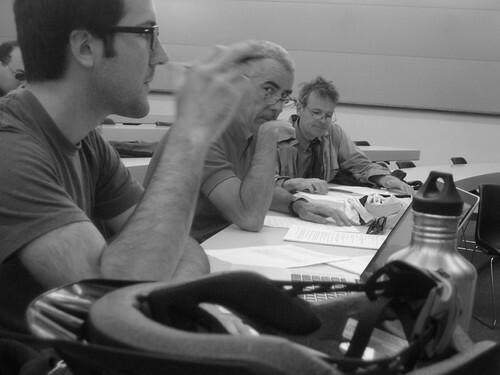 An image from the May 15, 2010 inaugural meeting of the League of Bike Voters Los Angeles. You’re invited to its first organizational meeting of the League of Bicycling Voters Los Angles, at 10:30 am on Saturday, May 15th, in room 1347 on the ground floor of the UCLA Law School building.. This meeting will start the process of transforming the League into a fully functioning political organization, including the election of a board and officers, forming committees and writing bylaws. Anyone who bikes and is eligible to votes in the County of Los Angeles is encouraged to attend. Consider this your wake up call. According to a 2002 survey sponsored by the U.S. Department of Transportation, 27.3% of Americans over the age of 16 ride bikes. And according to the City Clerk’s office, there are 1.6 million registered voters in the City of Los Angeles. Which means that roughly 400,000 voters in Los Angeles ride bikes; maybe more, maybe less. But lets be conservative, and put the number at over 300,000. [T]here are more cyclists registered to vote in Los Angeles than the total number of people who voted for all the candidates for mayor combined. In the city’s last mayoral election, only 17.9% of registered voters cast ballots; that’s just 285,000 people. In other words, even by the most conservative estimate, there are more cyclists registered to vote in Los Angeles than the total number people who voted for all the candidates for mayor combined. Which makes bicyclists one of the largest voter blocks in Los Angeles — and potentially one of the most powerful, capable of deciding who governs our city, our county and our state. That’s the purpose we envision for the League of Bicycling Voters Los Angeles. A countywide organization dedicated to harnessing the power of the cycling community to influence the electoral process. An organization that will host forums and debates to get candidates on the record for their stands on biking issues, endorse and support bike-friendly candidates and propositions, and hold elected officials accountable for keeping their promises. [An] organization dedicated to harnessing the power of the cycling community to influence the electoral process. This group is not liberal or conservative, Democrat or Republican. It does not represent any one group or style of cycling. It represents you, and thousands of other bicyclists in Los Angeles County, to help ensure safer streets and a more bike-friendly community for all us. Click here to join the conversation of the Google Group and help us form the new League of Bicycling Voters LA. See our introductory announcement and join our Facebook group to stay in the loop and spread the word. Posted on April 5, 2010 April 11, 2010 Categories News9 Comments on Consider this your wake up call.